For years, protecting steel from corrosion typically involved either the use of hot-dip galvanizing or a barrier system such as painting or powder coating. Today, however, more and more corrosion specialists are utilizing both methods in what is commonly referred to as a duplex system. Extended Corrosion Resistance – No single corrosion protection system can match the corrosion resistance afforded for most applications by painting over hot dip galvanized steel. Aesthetics – Painting the galvanized coating provides an alternative aesthetic appearance, enabling materials to be matched to a specific environment. Synergistic Effect – It is typical for a duplex system to provide corrosion protection 1.5 to 2.5 times longer than the sum of the lifetimes of zinc and paint used individually. For example, if a galvanized coating is expected to last 40 years and a paint system is expected to last 10 years, galvanizing and paint together should last 75 years with needed maintenance, or 1.5 times the sum of both systems. Economic Benefits – Because duplex systems greatly extend the service life of a product, maintenance costs are significantly decreased. Additionally, a product lasts longer before it must be replaced, thus decreasing the life-cycle cost. Safety Marking & Color Coding – Galvanized steel can be painted to conform to safety color regulations. 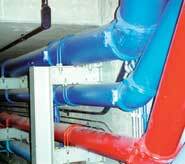 Color coding can be used to increase safety in many environments. Ease of Repainting – As the paint film weathers, the zinc in the galvanized coating is present to provide both cathodic and barrier protection until the structure is repainted. The exposed zinc surface can be repainted with minimal surface preparation.